And the lists are endless. And the 'to do's'. And the 'to do nots'. The projects I promise myself that this week I'll begin..and those I pledge to finish. The phone calls.. the emails..the after-weekend catch-up. It's always the same. Filled with the hope that this week will be long and productive. A one that I will fill - without question or doubt - with unending creativity. As I near the end of a day that began as one when all would be accomplished..I'm finding that altho some of my 'to do's' are crossed off my long list..that most have hardly been looked at. I jump from one thing to the other..without getting anything actually completed and done. The ideas are plentiful. The follow-thru is pitifully poor. I have to remind myself to stay focused. One thing at a time. What doesn't get itself done today..will surely get itself done tomorrow. Lot of time and space in the week to come. This is only the beginning. 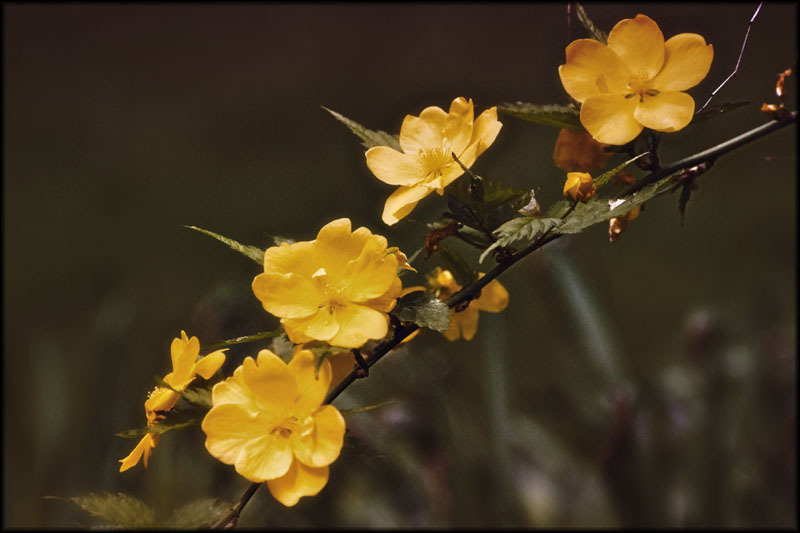 Today - these sweet and delicate yellow blooms adorn the bush that sits outside my window. Tomorrow - they'll be gone.